While large enterprises may be lagging behind others in adopting cloud communications technology, that's not the case for The Nielsen Company, a 45,000+ employee global giant. 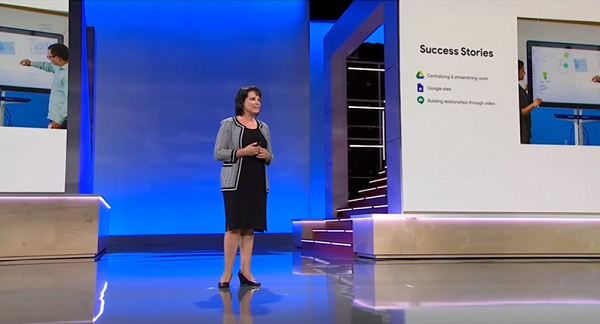 As Nielsen CIO Kimberly Anstett shared on stage at Google Cloud Next '18 last week, the company recently decided to transform its business through the adoption of a variety of cloud solutions. In 2015, the IT began searching for an enterprise platform that would enable faster collaboration and more robust innovation for teams at all Nielsen locations, Anstett said. Nielsen ultimately chose to partner with Google and its six-month program ended with a successful cutover, in July 2016, of the whole company in a single weekend. The business outcome was is more than 90% of associates collaborating in Google Drive -- totaling 56,000 G Suite accounts -- and 500,000 video calls per month. In fact, Nielsen embraced video conferencing fully. "I would say the biggest change, and for me the biggest win, was how our teams connected and developed deeper relationships," Anstett said. "High-quality video is an absolute must for today's workforce. Our teams use Google Meet to discuss ideas, to collaborate on our most challenging problems, and to give each other feedback face to face. Paired with the Google Jamboard, we finally have all the benefits of in-person collaboration without asking our employees to travel all around the world." The use of video conferencing has led to the reduction of travel expenses for the company and more time for employees to spend outside of airports with their friends and families, she added. Video aside, real-time collaboration is a must for any digital transformation to be successful, Anstett said in sharing lessons learned from Nielsen's journey. "We found that with Google Drive," which eliminates "blue screen of death" lost work scenarios or time wasted in waiting for a colleague to send a document or presentation, she said. "We no longer have time to waste and we can't lose any work." Across the organization, Nielsen departments are finding unique value with Google Cloud solutions. The finance department, for example, uses Google Sheets and Google Data Studio to enhance transparency and provide better reporting capability to their accounting process, Anstett said. The HR department uses App Maker to develop custom surveys for unique personas for new hires. HR feeds the data into Google Data Studio and uses the reporting to make better-informed decisions during the on-boarding process, she said. And Nielsen adopted Google Sites for its intranet. "We wanted to have a site that was easy to maintain and manage, but more importantly, we wanted to give our employees a fresh digital experience for how they access information about Nielsen," Anstett said. Toward that end, IT partnered with the Google product team to launch with capabilities it wanted that the product didn't yet offer: enhanced search, a G Plus feed, and enhanced corporate branding. That extra effort made the deployment a "complete success," Anstett said. "Within the first 24 hours of go-live, we saw thousands of associates who were on our brand-new company intranet on their mobile and laptop devices from 74 countries." Anstett credited Nielsen's transformation success, in part, to its partnership with Google. On the day of the cutover, more than 100 Googlers came to Nielsen offices to help with the transition, answer questions, and celebrate, she said. "I knew in that moment that I had a partner in technology that was deeply invested in Nielsen's success." Since the deployment, Nielsen has provided feedback to Google engineers, who in turn, provided hundreds of new features on G Suite that help make Nielsen's work more efficient, Anstett said. Nielsen participates in Google's Trusted Tester program and Early Adopter program, which allows associates to directly influence product features. "Google has also provided us with a great open client community, where we can talk amongst ourselves as clients and help with the product roadmaps, share best practices, in a way that is extremely valuable," Anstett said, referencing Nielsen's membership in Google's Technical Advisory Board. As Paul-Henri Ferrand, president of global customer operations at Google Cloud, noted during a separate Next presentation, McKinsey has found three traits common to companies that have undergone successful digital transformations: They align their corporate strategies with their digital strategies; their leaders are nurturing a fast-changing agile culture so that it sets up its own people to maximize the potential of the technology; and they focus on people, talent, process, structure, and systems, he said. Nielsen fits the bill. "Our transition to Google has been an amazing success," Anstett said, in closing. "We have had challenges along the way, but in every way have come out with a stronger platform, the cultural alignment we wanted in terms of a more engaged, robust collaborative environment, and it's been a wonderful way to get to work with such a great partner like Google and to bring smiles to all our associates' faces."